Successfully Added Keychain UV Intensity Meter to your Shopping Cart. Keychain UV intensity meter for detecting and measuring the suns UV intensity. 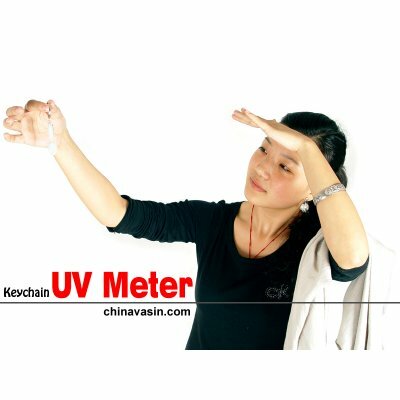 This key chain style UV meter is designed to quickly measure the suns UV intensity and provide you with a numeric indication of the current UV index. Styled to be hung along with your keys, mobile phone, handbag, backpack, necklace, or in your pocket, this unit can easily be carried around so it is always available to use. You can never be too careful these days, especially when the suns UV rays are becoming more of a health concern to our skin as we get older. This miniature UV meter can really be a simple lifesaver for anyone wanting to make sure they protect themselves from the potential of skin cancer and other harmful effects of intense sun exposure. By simply turning on the Keychain UV Intensity Meter and waiting a quick five seconds you will get a precise measurement that is displayed as an intensity number as well as colored LED light to help you easily identify todays UV level. With this knowledge you can more easily determine if you need to take any precautions before participating in any day long outdoor activities. We are offering this UV intensity meter key chain at a quantity of at least 10 pieces in order to give you the absolute best re-sale profit margin from our low wholesale price and even better shipping rates. Keychain UV intensity meter for measuring the suns UV intensity. This UV meter can help you choose the anti-sunburn skin-care product you need to use for your day outdoors. Is it really that simple to use? Yes. Turn it on and you get the result. If you get a green light and a index number of 2 then you know it is alright for a day of hiking while if you get a red light and 8 on the index then you know it is not a good day to go hiking unless you wear plenty of protection. Can I use this UV intensity meter indoors? Yes, but it will not measure anything. The meter is specifically designed to measure solar UV radiation, which cannot normally be found indoors.